At the turn of the last century C.G. Jung began his career as a psychiatrist. During the next decade, three men whose names are famous in the annals of medical psychology influenced his professional development: Pierre Janet, under whom he studied at the Sappetriere Hospital in Paris; Eugen Bleuler, his chief at the Burgholzli Mental Hospital in Zurick; and Sigmund Frued, whom Jung met in 1907. It is Bleuler, and to a lesser extent Janet, whose influence is to be found in the descriptive experimental psychiatry composing Volume I of the Collected Works. These papers appeared between 1902 and 1905l most of them are now being published in English for the first time. 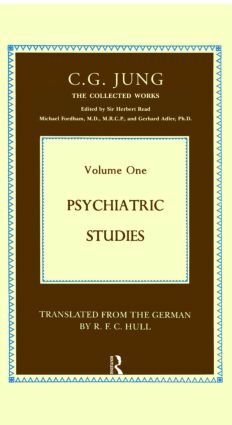 The volume opens with Jung's dissertation for the medical degree: 'On the Psychology and Pathology of So-Called Occult Phenomena', a study that foreshadows much of his later work, and as such is indispensable to all serious students of his work. It is the detailed analysis of the case of an hysterical adolescent girl who professed to be a medium. The volume also includes papers on cryptomnesia, hysterical parapraxes in reading, manic mood disorder, simulated insanity, and other subjects. Editorial Preface. Editorial Note to the Second Edition. I On the Psychology and Pathology of So-called Occult Phenomena. 1 Introduction. 2 A Case of Somnambulism in a Girl with Poor Inheritance. 3 Discussion of the Case. 4 Conclusion. On Hysterical Misreading. II Cryptomnesia. III On Manic Mood Disorder. IV A Case of Hysterical Stupor in a Prisoner in Detention. V On Simulated Insanity. A Medical Opinion on a Case of Simulated Insanity. VI A Third and Final Opinion on Two Contradictory Psychiatric Diagnoses. On the Psychological Diagnosis of Facts. Bibliography. Index.